We hadn't had people over while we were doing up the house in the last year or so. Now we're near to completion with the planned home improvement projects, we thought we'd have a few friends over. The work is not complete by any means, but we'll have to do the rest of it in the future as funds allow. Our youngest daughter's birthday was a couple of days away, so we thought this was a perfect opportunity to entertain. My husband had bought me some flowers a few days earlier, so I thought I'd make up a nice bouquet and add some plants from the garden to it. As you can see (the vase below), I added ivy, rowan berries (the red berries at the bottom), some stalks of grass and other plants, and even a stalk of hosta flowers. Together with the flowers, the garden plants made a fantastic centre piece which the guests loved. I've always loved the display of leaves (like holly leaves) and berries, mixed with a bit of fir trees' leaves and garden grasses for my indoor display. Gift wrapping ribbons always complete the stylish look, and the longer plants like ivy provide the 'trails' that make it look elegant. 1. 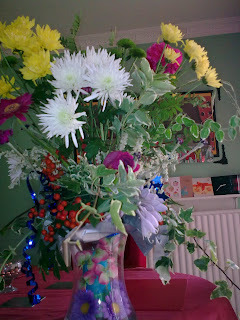 Do you display wild flowers or garden plants in your indoor vases. 2. What are your best garden plants (or wild flowers) to use indoors. This post is linked to Self Sagacity for Thursday Two Questions. 1) I seldom cut my garden flowers since I like to see them when I'm outside, but I do picked wild flowers such as chicory, and fleabane to display in vase. 2) I love zinnia, and this year, African daisy for their continuous blooms. 1. I tried doing that but they died. I fed and water them but they still died. 2. I am clueless about which would be best to use inside. To tell you the truth Anne, I would love to do more of cutting and displaying the flowers around my home. Unfortunately, I don't have time to do it as often as I like. The best flowers that I like to cut from my yards are Dahlias, Zinnias, they are very vibrant and gorgeous. I sometimes do arrangements, I like having flowers and plants in my home. My favorites are roses, Shasta daisies and dahlias. I like to pick the roses just as the bud begins to open, that way they last longer. I can see that (whether we know how or not) we all love to have the flowers indoors. SQ, roses are great indoors. I think they are my best too.